When searching for a new place to call home, many homebuyers will pass over older homes. They worry that an older home will be full of problems that will require expensive repairs, or that the layout or design will be too dated. 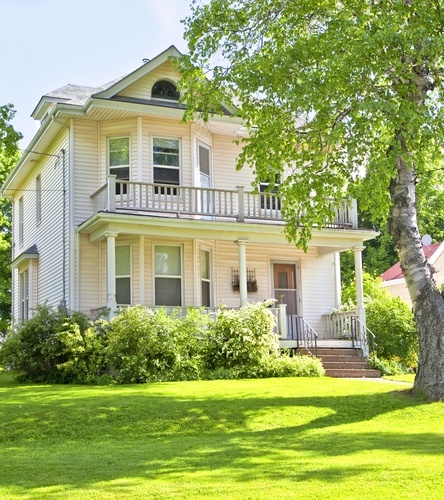 While there are some risks associated with buying an older home, there are benefits as well. Here are some of the best reasons why you should consider buying an older home. Let’s face it – many of the new homes on the market today lack character. When developers design new subdivisions, homeowners generally have just a few layouts to choose from. All the houses end up looking similar. If you crave a little more diversity, an older home is the way to go. Many older homes have great character with unique qualities that make them different from the other houses on the block. You’ll also find more interior details like carved moldings, wainscoting, and pocket doors. “They don’t make ‘em like they used to” is unfortunately true. In an effort to make housing more affordable, new homes often use lower quality materials, such as hollow core doors or cabinets made from particle board. When you buy an older home, you’re more likely to find better craftsmanship and higher quality materials, like solid wood doors and cabinets. These materials hold up better over time and often age beautifully. As cities grow, new homes are built further and further away from the city center. When you buy an older home, you’re more likely to be in an established neighborhood closer to amenities like shops and restaurants. You’ll find that some of your neighbors have been there for years or even decades. There’s likely to be a greater mix of ages, from young families to empty nesters, and a built-in sense of community. Your neighborhood will also have more mature trees and vegetation, adding to the beauty of the community. Generally speaking, an older home that is comparable in style and size to a new home will be less expensive. Because the home is older, there’s usually more room for negotiation with price – more than what you would find in a neighborhood with all new construction. Of course, you may end up using those savings to make repairs and updates to the house, but those investments will increase the value of your home when it comes time to sell. In addition, you’re less likely to live in a community that’s governed by a homeowners association, saving you monthly fees for maintenance and repair of common areas. Finally, older homes can have great investment potential. Older homes that are in great condition or in a great location can be hard to come by, giving you a leg up in the marketplace when it’s time to sell. This is especially true if your home has any unique architectural features that aren’t found in newer homes. If you make well-chosen renovations, you can boost your home’s value by more than what the project takes to execute, as long as it’s done well.